If you’re looking for a convenient means of transport to tour the North London districts or if you plan on renting a spacious vehicle that can fully accommodate your bulky equipment and work essentials… come and see us! There is a very good chance that our North London minibus hire service might just be what you’re looking for! London minibus hire is a popular choice for group travellers who wish to see more of the picturesque city; it provides a great means of transport for holiday outings, school trips and commercial use in and around North London. Aside from the convenience, this service can also assure a low cost, private journey… since you can just divide the fee among your travel cluster! All available at competitive prices; choose from our 9-seater, 14-seater and 17-seater minibuses. Drive around North London in style and comfort – our minibuses assure ample space for all your travel requirements. Regularly cleaned and checked before each new hire, they are furnished with 3-point seatbelts and a CD player. For an even more enjoyable trip, you can also opt for some portable extras like our GPS or twin port USB adapters! 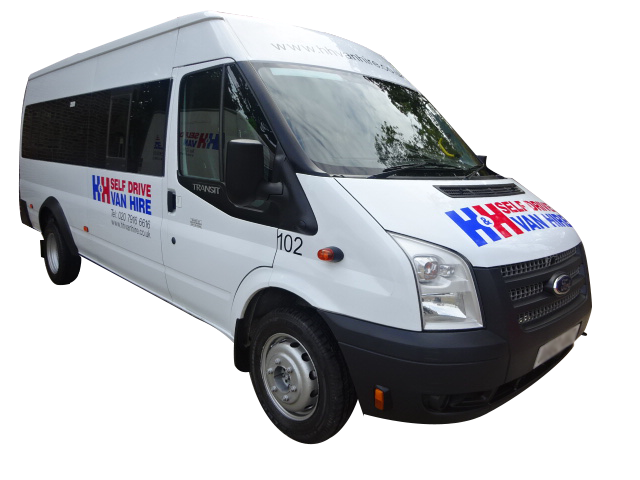 Why Choose H&H’s Minibus Hire Service? Unlike other van hire companies in London, we take great pride in our all-inclusive price; as our rates come with no hidden charges! Still not convinced…? Then take a peek at the testimonials from past clients who have travelled the City, H&H style! Wherever, whenever, whatever… you can trust H&H Van Hire for a totally stress-free hire experience! With all your enquiries, please call +44 20 7916 6616 and we’ll have you on the road in no time.